Tarps Direct 13 ounce Vinyl Laminated Polyester (VLP) tarps are flame-retardant, waterproof, UV and tear resistant. 13 ounce VLP tarps are great for canopies/tents, paint booths, gym floor covers, inside room dividers, triage tarp, firewood covers, salvage covers and any other application that requires a durable flame-retardant tarp. Rustproof brass grommets are located in corners and approximately every 24 inches on all four sides. Meets NFPA-701 and CA Fire Marshall Flame-retardant specifications. VLP tarps are listed as a cut size – finish size is 6" or 3% to 5% smaller. Call for pricing and delivery for custom sizes, Gym floor covers and combination curtains. Swatch samples available upon request. Hemmed with Brass grommets in corners and approximately every 24 inches on all sides. *13 oz can be made into combination curtains with 20 mil clear & multi colors, call for details. Tarps Direct offers the finest poly tarps around; however, some jobs are best suited for other material. Our US made vinyl tarps are great for jobs that require a heavier duty, longer lasting tarp than what standard poly tarps may be able to handle. All of Tarps Direct's vinyl tarps have rust resistant brass grommets on corners and every 24" which provides for superior strength. Vinyl tarps are also waterproof and mildew resistant which makes them great for applications that may involve water, such as covering equipment. Because of their UV resistant quality and strength, vinyl tarps are able to withstand detrimental weather conditions including exposure to sun. Their durability offers a great solution for more permanent coverings on items such as agricultural and construction equipment. Certain vinyl tarps are flame retardant creating a perfect solution for fire companies as well as possible welding dividers. 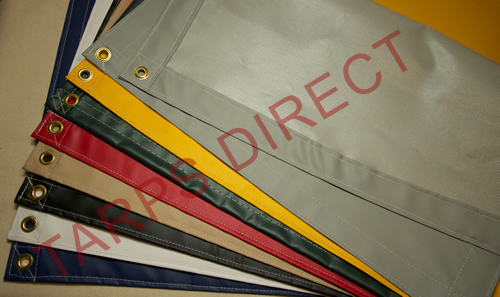 Tarps Direct's 18 and 22 ounce vinyl are oil, acid, and grease resistant which makes them great for any factory. Our vinyl tarps are a long lasting and durable, which makes them the perfect tarp solution for any situation.